If audiences found Judge Dredd (1995) too campy and cartoonish in its portrayal of the violent comic book hero, Dredd (2012) heavily overcompensated. The violence level was increased to the point that it felt more like carnage than action, and it was all done with stunning 3D visuals. Even without the 3D (which is available on the Blu-ray disc included in the package), the 4K Ultra HD presentation is among the most impressive I have seen. The only problem is that some of these spectacular visual effects are so horrendously violent that it may be difficult to enjoy how good it looks. 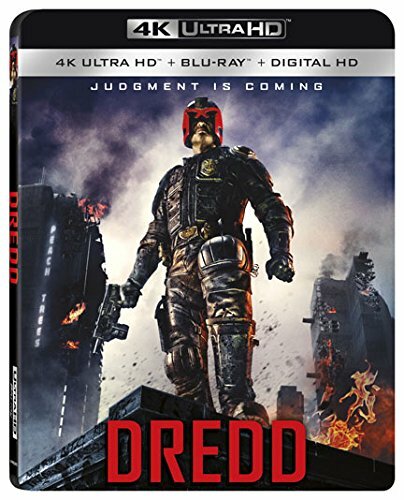 Set in a dystopian future world where law enforcement officers are entrusted with the ability to sentence criminals in the field, Dredd (Karl Urban) is a judge who is relentless in his standards in the pursuit of justice. This makes him the ideal candidate to test a new recruit named Anderson (Olivia Thirlby), who also happens to be equipped with a mutated psychic ability. When they are called to a dangerous district to investigate murders inside a massive skyscraper, the judges discover a criminal kingpin named Ma-Ma (Lena Headey) is using it to control the entire city’s supply of a mind-altering drug called Slo-Mo. Slo-Mo allows for some of the film’s most impressive visuals, which are also often the most disturbing. Users of the drug have their perception of time slowed, and director Pete Travis utilizes this for creatively violent means. On one hand, these moments are among the most beautiful images you are likely to find for your 4K systems (the enhanced colors are particularly spectacular with the High Dynamic Range), but they are also often cringe-worthy and psychologically traumatizing. Unfortunately, however much the violence has been increased in this comic book reboot, the downfall is the lack of fun in the action. It is a graphic but somber affair, missing a bit of escapism or humor which might have made the violence more bearable. There is also an issue of unoriginality in the screenplay, especially once they arrive at the massive building run by Ma-Ma. Rather than risk Judge Dredd and Anderson discovering the secret empire within, Ma-Ma decides to murder them instead. After locking down the building, she uses an intercom to pit the entire building against the officers, which is nearly the exact same plot of the highly popular foreign action film, The Raid: Redemption. This comparison would not be as big of a problem if the action in Dredd were more creative in anything other than the disturbing slow-motion photography. As previously mentioned, this 4K release also comes with a Blu-ray, as well as a Digital HD copy. Although there are special features on the Blu-ray disc, they are contained on the 4K disc as well. The extras include six featurettes and a motion comic prequel to the narrative, as well as the theatrical trailer. Along with a generic making-of featurette, there is also one about the history of Judge Dredd, one on the primary location in the film, the gear worn by the judges, the film’s visual effects, and another for the 3D elements of the film. This is a must-have for fans of the film, and will easily showcase impressive home entertainment systems.